- Battlefield™ V players may experience character outlines stuck on screen after being revived. 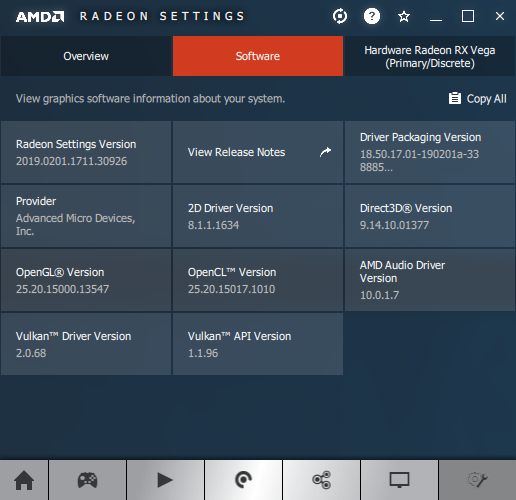 - Radeon Settings may fail to install while doing a software update on some Hybrid Graphics system configurations. - Some displays may experience a loss of video when launching a fullscreen application with Radeon FreeSync enabled. - Anthem™ may experience a white screen or corruption while playing or launching the game. - Radeon Settings may experience a crash if the user changes tabs quickly with a very large game list. - Fixed an issue where Radeon Settings update notifications may suggest older driver releases to upgrade to. - HDMI Underscan settings may not retain after system restart. - Radeon ReLive may intermittently experience captured recordings or Instant Replays with inverted colors. 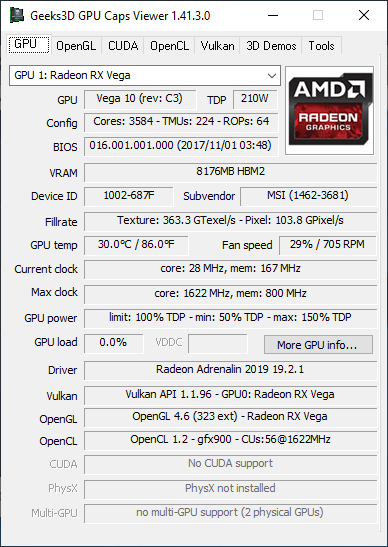 Same OpenGL and Vulkan support than Adrenalin 19.1.1.